You right there! Stop at once! I'm in a good mood right now, so this better be good. I must apologize... Your journey ends here. Ah, you're sweet little Saragimaru, right? Gh...! Why do you know my name?! Gh... you... who are you, even? ...And why do you hinder Master Yaorochi? I cannot simply let that stand. All those who hinder Master Yaorochi are my enemy. I mean that I'm not the enemy of you or your fellow snakey snakes. Then why did you get in Master Yaorochi’s way? Just collecting information. Or rather, I just ran into them...? ...Explaining it all would be a pain. I will make you speak, even if I must use force. Witness it, and never forget it! Fresh blood spilled on white snow would glimmer oh-so-beautifully, wouldn't it...? Well, I won't be doing any killing today, though. You… who are you, really? 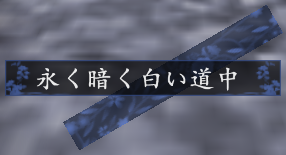 ↑ For some reason, Saragimaru's boss title does not appear in-game.